Check in for 7:00 am departure from Dublin Heuston, opened in 1844 as the headquarters of the Great Southern & Western Railway and is now the official principal station of Iarnród Éireann, Ireland’s national railway company. As your train departs, we travel in a south westerly direction, through Dublin's western suburbs and then through the lush fertile countryside of Co. Kildare. Our journey takes us through the Curragh which is famous for its racecourse, home of the Irish Derby, and there are many stud farms in the vicinity. The final approach to Cork station is through Ireland's longest railway tunnel, which is a rather modest 1.2km. 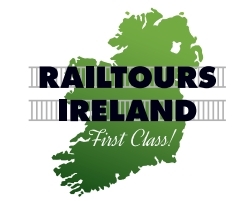 Arrive into Cork Kent Station, we transfer to our Railtours Ireland tour coach through Cork City to Blarney Village and historic Blarney Castle, built in 1446 by Dermot McCarthy. You will have time to kiss the famous stone, which is said to bestow the gift of eternal eloquence on those lucky enough to do so. There is also time for shopping and lunch at Blarney and we recommend that you have lunch there, as this will be the only opportunity during the day to have a substantial meal. Depart Blarney Castle. for Cóbh, via the city center and a short city tour. Cork’s population is approximately 150,000 (Ireland’s 3rd largest city after Dublin and Belfast) and is the only city center in Ireland that actually stands on an island, the River Lee divides and rejoins and either end of the city center. It is also home to Murphy’s and Beamish, the Southern Capital’s rival to Guinness. On arrival at Cóbh we will visit St Colman’s Cathedral. We will then proceed down along the sea front passing the former White Star Line offices en route to the beautifully restored Victorian railway station/transatlantic terminal. This is now the Cóbh Heritage Centre, home to the Queenstown Story. When Queen Victoria visited Ireland in 1849 she came to Cóbh and the town was renamed Queenstown in her honor – it was renamed Cóbh after Irish independence in 1922. Cóbh was of course the final port of call of the RMS Titanic and this theme is well expounded. The center also houses much information about the Great Famine and subsequent Irish Emigration, 3 million Irish people emigrated from Cóbh, (principally to the United States) including Annie Moore, whose statue is located in front of the heritage center. The Lusitania was torpedoed off the coast of Cork –marking the United States’ entry to the First World War and the small number of survivors were brought to Cóbh for refuge. Cóbh is also the headquarters of the Irish Navy and you will most likely see some navy ships. Depart Cobh by train to Killarney. The rest of the evening is free and there is a large selection of cafés, restaurants and bars in Killarney town as well as many opportunities for live traditional Irish music entertainment. 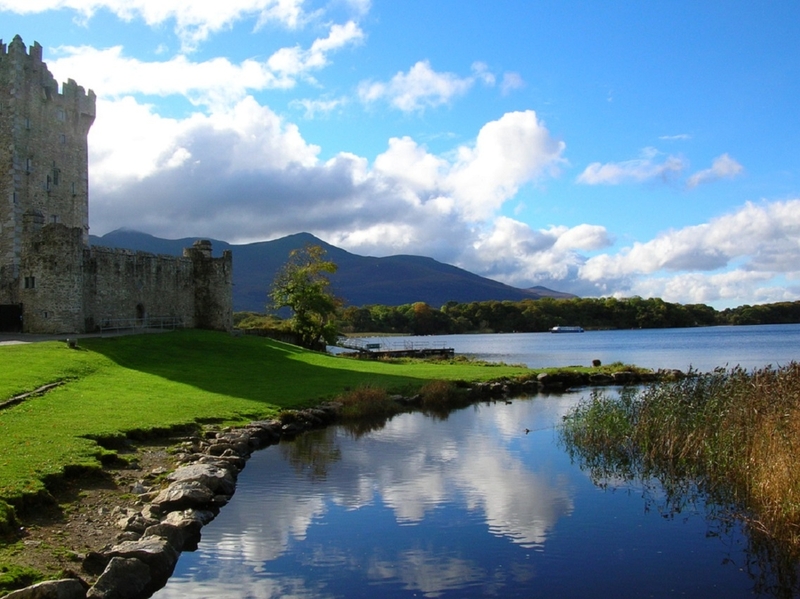 Overnight Stay: Killarney B&B (unless you upgraded to a 4 * Killarney hotel at time of booking). Enjoy a Full Irish Breakfast at your leisure. There are plenty of stops along the Ring of Kerry for morning tea, lunch and photo stops etc. Ireland’s highest mountains are located in Kerry and Carrauntouhil, which can be seen en route. It is the highest, standing at 1041 meters. We will make a stop at the Kerry Bog Village Museum, which gives people an insight into how people lived and worked in rural Ireland in the 18th century. The village is the only one of its kind in Europe. Later on the approach to Waterville there are views (weather permitting) of the Skellig Rocks (islands), where Star Wars 'The Force Awakens' was recently filmed. We will make several photo stops, a stop for lunch and one final stop at the pretty village of Sneem, for about 30 minutes, or as directed by your tour leader. 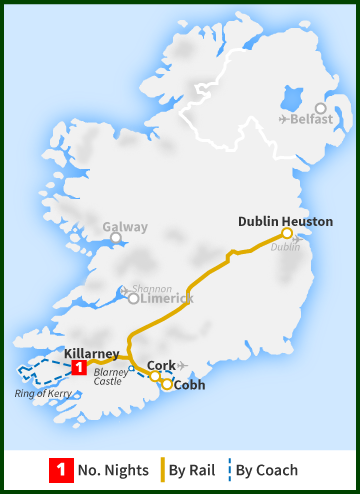 5:35 pm departure from Killarney for Dublin by train and change trains at Mallow Returning to Dublin Heuston at 10:00 pm.